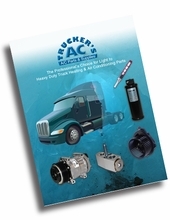 The Professional's Choice for Light to Heavy Duty Truck Heating & Air Conditioning Parts and Accessories. We carry a complete selection of AC and Heating Parts for all makes of trucks and off-road vehicles. We feature Sanden, Seltec, Denso, Ford, GM, T/CCI compressors parts and more. Our website is continually updated to keep current with the market and your needs. Everything we sell is New, Brand Specific and comes with an Original Manufacturer's Warranty so you can Shop with Confidence!